Mother: Umm Abdullah, the daughter of Imam Hasan (a.s.). Birth: He was born at Madina in the year 57 A.H.
Martyrdom: He died of poisoning in Madina in 114 A.H. and is also buried at Baqi near his father. Imam Muhammad baqir (pbuh) was born in the 57th year of the Hijra, on Friday the first day of the month of Rajab, in the city of Medina. His honored father is Imam Sajjad (pbuh) and his revered mother, Fatima, daughter of Imam Hasan (pbuh). He was the only Imam who was Alawiite from both the side of the Mother and the Father. Imam Sajjad (pbuh), according to the command of Allah and the decree of the Prophet (pbuh), appointed his son, Imam Muhammad baqir (pbuh), to Imamate and leadership of the people in the 95 A.H. He remained Imam for the rest of his life until 114 A.H. and the total period of his Imamate is 19 years. Allama Hajr Makki writes in Sawa’eq-e-Moharaqa (Page 120) that He was the true copy of his father Imam Sajjad (pbuh) in knowledge, piousness and prayers & supplications. baqir is a derivate of the word “Baqara” which means to open up or to expand. 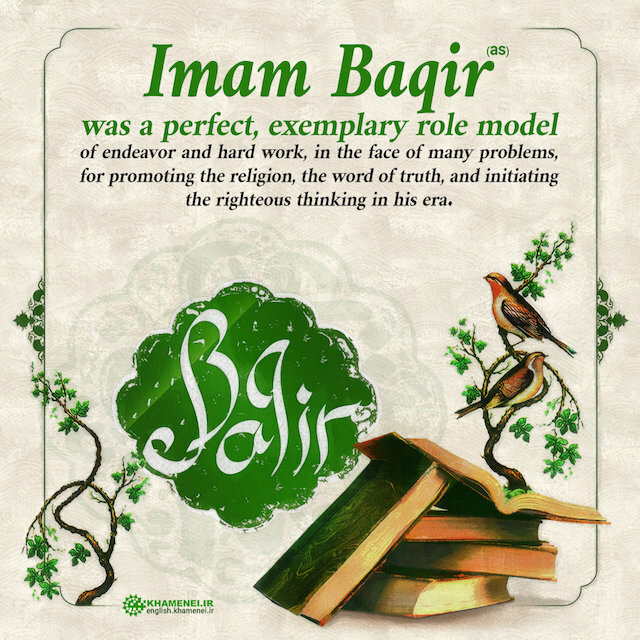 Imam Mohammad baqir (pbuh) was named as such since he introduced and spread the knowledge and teachings of various dimensions and implemented the knowledge streams in a manner which had never been seen earlier. Allama Noor Allah Shostri says in Majalis-al-Momineen (Page 117) that Prophet Mohammad (pbuh) said that Imam Mohammad baqir (pbuh) will introduce, spread and open up knowledge just like the ground is opened up for cultivation. Imam Muhammad baqir (pbuh) instructed people in percepts of religion, taught exegesis of Quran, taught them the ethics of life, and used to strive very hard to educate culture and guide the people. During the course of his life, he taught the people thousands of theological and religious principles, as well as scientific subjects, and his teachings have been handled down to us.Imam Muhammad baqir (pbuh), like the other Imams, in knowledge and science had no equal. Great learned men benefited from his knowledge and science and used to ask him to solve their problems. Imam Mohammad baqir (pbuh) was about two and a half years old when he had to accompany Imam Hosein (pbuh) and the rest of his family members on the journey to Karbala. After the tiring journey from Medina to Karbala, he witnessed the shocking and tragic events ofKarbala and then the heart-rupturing events inSyria and Iraq. After one year of detention in Damascus he returned in 62 A.H. to Medina when he was 4 years. During the Imamate of the Imam baqir, as a result of the injustice of the Umayyads, revolts and wars broke out in some corner of the Islamic world every day. Moreover, there were disputes within the Umayyad family itself which kept the caliphate busy and to a certain extent left the members of the Household of the Prophet alone. From the other side, the tragedy of Karbala and the oppression suffered by the Household of the Prophet , of which the Fourth Imam was the most noteworthy embodiment , had attracted many Muslims to the Imam. These factors combined to make it possible for people and especially the Shiites to go in great numbers toMedina and to come into the presence of the Imam. Possibilities for disseminating the truth about Islam and the sciences of the Household of the Prophet, which had never existed for the Imams before him, were presented by Imam baqir. The proof of this fact is the innumerable traditions recounted from the Fifth Imam and the large number of illustrious men of science and Shiite scholars who were trained by him in different Islamic sciences. These names are listed in books of biographies of famous men in Islam. It is a proven fact that Prophet Mohammad (pbuh) had informed about the birth of Imam Mohammad baqir (pbuh) about 64 years before his birth. Sheikh Saduq states in his book Amali (page 353) – Imam Jafer Sadiq (pbuh) narrates that one day Prophet Mohammad (pbuh) said to Jabir bin Abdullah Ansari “you will stay alive until you meet my son Mohammad bin Ali bin Hosein bin Ali bin Abi Talib (pbuh)who is mentioned in the Torah as baqir. Give him my salutation (salam) when you meet him”. One day when Jabir visited Imam Zain-ul-Abideen (pbuh), he saw the young boy sitting next to the Imam (pbuh). He addressed the young boy and asked him to come closer and show his back. Then he proclaimed that by God, that young boy had the features and traits of the Prophet Mohammad (pbuh). Then he asked Imam Sajjad (pbuh) who the young boy was and Imam (pbuh) replied that he was his son and the successor to the Imamate and his name was Mohammad baqir (pbuh). Hearing this, Jabir rose up and kissed the young Imam and said “Son of Prophet (pbuh), may I be taken ransom for you, accept the salutation (salam) of Prophet (pbuh). He asked me to convey it to you”. Imam Jafer Sadiq (pbuh) states that his father burst into tears on hearing this and said “Jabir my salutation to my grand father until this sky and earth survives. You conveyed the salam of my grandfather to me so I convey my salam to you as well”. The founder of the Hanafi School of thought, Imam Abu Hanifa was a disciple and student of Imam Mohammad baqir (pbuh) for a long period. He used to study fiqh and ilm-e-hadees and other branches of knowledge from the Imam (pbuh) and both Shiite and Sunni scholars agree that most of his knowledge was derived and obtained from Imam Mohammad baqir (pbuh). Allama Shabrawi Shafaee writes that on several occasions Imam Mohammad baqir (pbuh) tested Abu Hanifa on matters of fiqh and Abu Hanifa could not answer them and then Imam baqir (pbuh) explained the reasoning and logics to him.Abu Hanifa was also an associate of his son Imam Jafer Sadiq (pbuh) and benefited a lot from his knowledge as well. In 100 A.H., Hasham bin Abdul Malik became the Caliph. He was a known enemy of the Ahle Bait (pbuh) and he did not waste any opportunity to bring hardship to the Ahle Bait (pbuh). Allame Majlisi writes that during the last days of his caliphate, Hasham came toMecca for Hajj. Imam Mohammad baqir (pbuh) and his son Imam Jafer Sadiq (pbuh) were also present. Hasham was informed that Imam Jafer Sadiq (pbuh) delivered a sermon among the Hajis that he and his father were the Allah”s vicegerent and His command on earth and whoever was their friend and well wisher will go to heaven and whoever is their enemy will be destined to hell. This infuriated Hasham and when he reached Damasacus, he ordered the governor ofMedina, Ibrahim bin Walid to send the two Imams (pbuh) to his court. Hasham had planned to malign the Imams in his court but the Imams (pbuh) overturned his plans which further ignited his enmity and he ordered the Imams (pbuh) to be jailed. While in the jail, Imam Mohammad baqir (pbuh) gave sermons to the other prisoners which created an atmosphere of great enthusiasm and devotion towards the Imam (pbuh) and against Hasham and sensing the gravity of the situations and the risk of a revolt, Hasham ordered the release of the Imam (pbuh). He then ordered the governor of Medina that Imam Mohammad baqir (pbuh) should be poisoned as he is becoming a constant threat (Jala-ul-Ayoon Page 262). The governor ofMedina – Ibrahim bin Walid carried out the orders and poisoned the Imam (pbuh) in 114 A.H.
Imam Muhammad baqir (pbuh), lived in this world for a period of 57 years, and in the 114th year of the Hijra, on the seventh day of the month of Zil-Hijjah, in Medina he left this world. His body was buried in Baqi cemetry alongside the graves of Imam Hasan (pbuh) and Imam Sajjad (pbuh) inMedina. Before his martyrdom, Imam Mohammad baqir (pbuh) instructed his son Imam Jafer Sadiq (pbuh) about several issues and said to him that he is hearing the voice of his father who is calling him (Noor ul Absar Page 131). He gave special instructions for his kafan and burial since only an Imam can say the prayers of an Imam (Shawahi-un-Nabowah page 181). Allama Majlisi states that in his will, he also mentioned that 800 Dirhams should be spent on his mourning and arrangement should be made thatthe Hajj pilgrims would commemorate his martyrdom inMedina for the next 10 years. scholars also mention that in his will, the Imam (pbuh) also mentioned that his kafan should be opened after his burial and his grave should not be higher that 4 fingers. 1 Rajab Sayyeduna Imam Muhammad al Baqir Alaihissalam ke Milad ka Din hai! Aap Sayyeduna Imam Hussain Alaihissalam ke Pote, Sayyeduna Imam Zainul Aabideen Alaihissalam ke Shehzade, Sayyeduna Imam Jafar as-Sadiq Alaihissalam ke Walid, Imam Abu Hanifa ke Ustad hain, Ilm ki Puri ek Kainat hain! Aapka Martaba Itna Buland ke Khud Tajdar-e-Kainat SallAllahu Alaihi wa Aalihi wa Sallam Apne Jalil ul Qadr Sahabi ko Apne Is Shehzade ki Aamad ki Khabar di!! Salawatullahi Ta’ala wa Malaikatihi wa Anbiyaihi wa Rasoolihi wa Jamiyi Khalqihi Ala Sayyedina Muhammadiw wa Ala Aali Sayyedina Muhammadin Alaihi wa Alaihi-Mussalamu wa Rehmatullahi wa Barakatuhu. Imam Baqir discussed all branches of science related to religion, some of which are as follows: Hadith (traditions) Imam Abu Ja’far (al-Baqir), peace be upon him, took great care of the traditions which were reported on the authority of his forefather, the Apostle of Allah, may Allah bless him and his family, and on the authority of all his pure forefathers, peace be upon them. That is because the hadith are the second source of Islamic law after the Holy Qur’an. An important thing to note is that Imam Abu Ja’far (al-Baqir), peace be upon him, took care to understand the meanings of the hadith. The hadith, which were reported on the authority of the pure Imams, peace be upon them, do not denote the personal ideas of the Imams, but denote the words of the Prophet, may Allah bless him and his family, and his ideas. The Shi’a therefore, have added the Imams’ traditions to the Sunna (practices of the Prophet). The Imam, peace be upon him, said to Jabir: “If we speak to you according to our own ideas, we will be from the perished. However, we speak to you according to the traditions we gather on the authority of the Apostle of Allah, may Allah bless him and his family, as they amass their gold and silver.”1 Exegesis of the Holy Qur’an One of the sciences which Imam Abu Ja’far (al-Baqir), peace be upon him, presented during his lectures was the exegesis of the Holy Qur’an. Indeed he devoted a good portion of his time to it. He discussed all of its matters. Various scholars of exegesis, although they may have had different opinions, studied under him as he was the most brilliant interpreter of the Qur’an throughout the Islamic nation. Imam Abu Ja’far (al-Baqir), peace be upon him, wrote a book on the exegesis of the Holy Qur’an. Mohammed b. Ishaq al-Nadim referred to this book in his book al-Fihrast, when he referred to books written on the exegesis of the Holy Qur’an. He said: “Abu al-Jarud Zyad b. al-Munzir, the head of the Jarudiya, reported the book of al-Baqir Mohammed b. Ali b. al-Husayn.” Theology Imam Abu Ja’far (al-Baqir) explored many theological matters during his lectures. He was questioned on the most complicated matters in this science and he answered them. It is worth mentioning, that the time of the Imam was the most sensitive of all times. That is because Islam had conquered most areas of the world and their people. This created a wave of spite in the souls of the enemies of Islam as well as others. Thus, they launched a propaganda campaign against Islamic thought. They placed doubt in the minds of the children of Moslems. Meanwhile, the Umayyad government was encouraging anti-Islamic thought and no one was prepared to save Muslims from such propaganda except Imam Abu Ja’far (al-Baqir), peace be upon him, who refuted it using strong proofs. Jurisprudence Most of the rules of jurisprudence of the Ahlul-Bayt, peace be upon them, were taken from the two Imams al-Baqir and his son al-Sadiq, peace be upon them. The Imami encyclopedias of jurisprudence, such as al-Hadaiq, al-Jawahir, and Mustamsak al-Urwat al-Withqa, are filled with hadith reported on their authority. Imami jurists depend on them when they decide on legal precepts and give religious opinions. The Characteristics of Imam Baqir’s School of Jurisprudence The jurisprudence of the Ahlul-Bayt, peace be upon them, has wonderful features, which have placed them at the peak of both Islamic and non-Islamic jurisprudence. The following are some of them: Connection to the Prophet (may Allah bless him and his family). One of the important features of the jurisprudence of the Ahlul-Bayt, peace be upon them, is that it is directly connected to the Prophet, may Allah bless him and his family. That is because the way to the Prophet, may Allah bless him and his family, is through the Imams of the Ahlul-Bayt, peace be upon them. Flexibility The jurisprudence of the members of the Ahlul-Bayt, peace be upon them, relates to life, keeps abreast of developments, does not deviate from nature, and meets all needs of life. Opening the Door to Ijtihad The jurisprudence of the Ahlul-Bayt, peace be upon them, is distinguished from other types of Islamic jurisprudence by the fact that it opens the door to Ijtihad (the establishing of religious opinion). Resorting to Reason Imami jurists, unlike jurists of other Islamic schools, regard reason as one of the four fundamentals necessary for establishing religious precepts. Science of the Principles of Jurisprudence One of the sciences, which Imam al-Baqir, peace be on him, investigated, was the science of the Principles of Jurisprudence (Ilm ul-Usul). It is one of the greatest Islamic sciences after jurisprudence. That is because Ijtihad (establishing religious opinion) depends on it. Economic Research Imam al-Baqir, peace be upon him, during both his lectures and his behavior, presented the most important economic research.